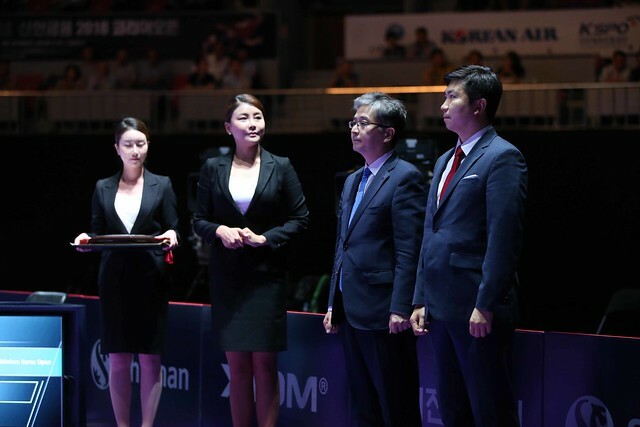 An immediate understanding, that would appear to have been the situation on the opening day of play when DPR Korea’s Choe Il partnered Korea Republic’s Yoo Eunchong to success in their Mixed Doubles qualification round to secure a place in the Seamaster 2018 ITTF World Tour Platinum Shinhan Korea Open. One day later on Wednesday 18th July at the same stage of the Women’s Doubles event; that scenario was exactly the same as Kim Song I from the north joined forces with Suh Hyon from the south in another gesture of unity. Choe Il and Yoo Eunchong had needed the full five games to beat Spain’s Alvaro Robles and Galia Dvorak, eventually succeeding by the very narrowest margins (8-11, 11-9, 8-11, 11-9, 13-11); for Kim Song I and Suh Hyowon, life for the two defensively minded players was less fraught. Against Uzbekistan’s Olga Kim and Regina Kim, they secured a straight games success (11-4, 11-5, 11-2). Success for the Korean Peninsula but there was also defeat in the preliminary round of the Women’s Doubles event; the DPR Korea duo of Choe Hyon Hwa and Pyon Song Gyong experienced a narrow reverse at the hands of Singapore’s Lin Ye and Zeng Jian (8-11, 13-11, 13-15, 11-9, 11-9).